“Hook & Ladder Company No. 4” (now known as the more prosaic “Station No. 11”), was designed by noted architects Hubbell & Greene. 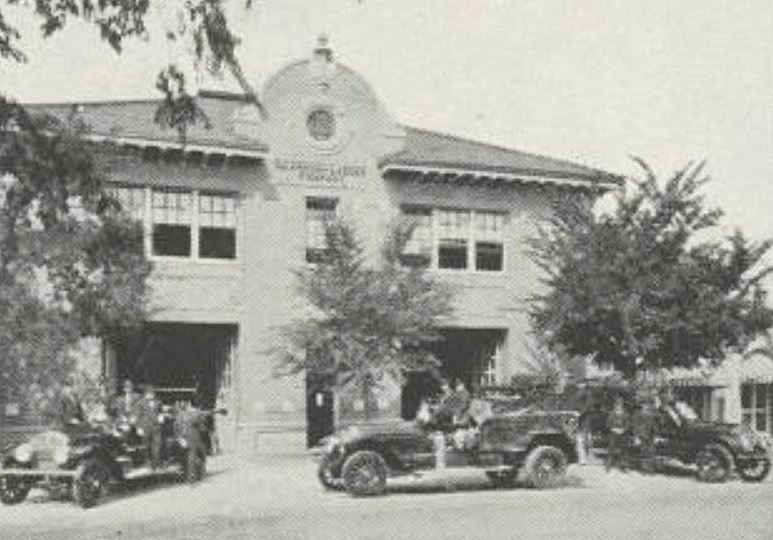 It was built at Cedar Springs Road and Reagan Street in 1909 as the first “suburban” fire station in Dallas. Still a working firehouse, the Mission Revival building is a designated historic landmark and is listed in the National Register of Historic Places. 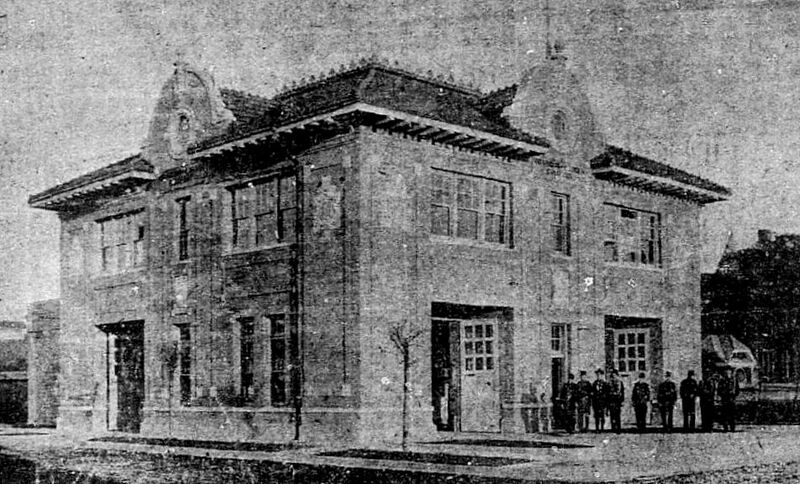 1909 Dallas Morning News photograph by Clogenson. Color image of the station as it looks today from Google Street View. Second black-and-white photograph is from The Man in the Leather Helmet: A Souvenir Booklet of The Dallas Fire Department (1931), via the Portal to Texas History. 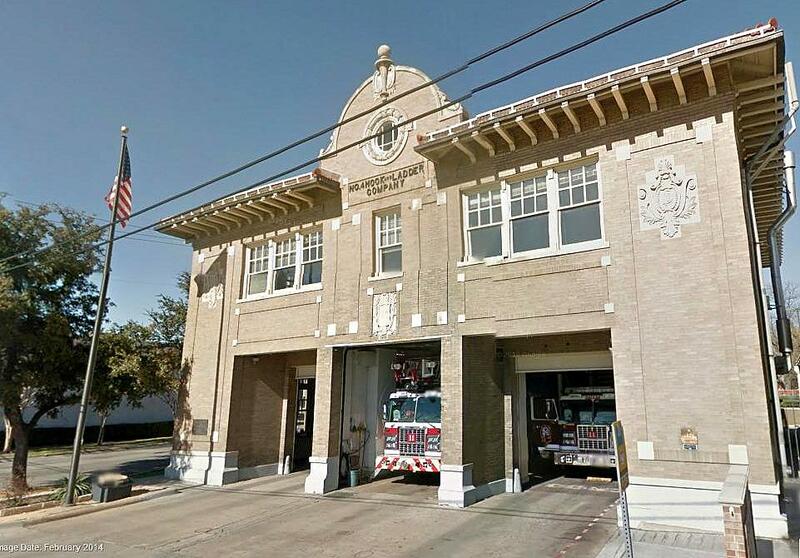 For more on the history of this historic fire station, see the page devoted to it on the Dallas Fire Rescue Department website, here. How great to see that it remains standing! I agree! It’s always a bit of surprise when you run across something like this that hasn’t been torn down. Great site. Love history, old pics, etc. Especially when it’s my home town. Noticed mentioned in the article about pre-1900 firehouses that pics of horse-drawn apparatus are rare. In the living room at 11’s is a large photo of horses pulling a steam pumper to a fire. I was told it’s a photo of the crew of our house. Of course, no one has proof of that, but it is certainly DFD. Come by and we’ll give you a tour.